My wife, Laura and I have been full-time RVing since August of 2011. After traveling the country for 6 months, we settled in Clermont, FL as a base of operations. We rented a site for 3 years before buying our own RV Lot at a luxury RV Resort. It is a place to call home, a domicile and a base of operations where we travel from and return to. We are about 12 miles from Walt Disney World. We own a 2001 Newmar Mountain Aire diesel pusher with upgrades including a residential fridge, flat screen TV’s, recliner chairs, swivel task chairs at the table and a Sleep Number bed. Cocktails for 6, dinner for 4, sleeps 2! In the meantime, Laura works full time as a photographer at Walt Disney World Magic Kingdom and I drive one of the Disney buses taking guests to and from the resort hotels to the theme park (Part Time). We meet many wonderful people, both those at the RV Resort and at Walt Disney World. I feel I am on vacation every day as we wake up to the beautiful Florida weather, eat breakfast outside and just relax. We have access to any of the Disney Parks for free as part of our compensation package. We really enjoy EPCOT’s Food and Wine Festival and the way all the parks and resorts decorate for the festive holiday season. We see/hear fireworks every night! One of the great benefits is a significant discount at Fort Wilderness Campground, where we go for a few days several times a year. 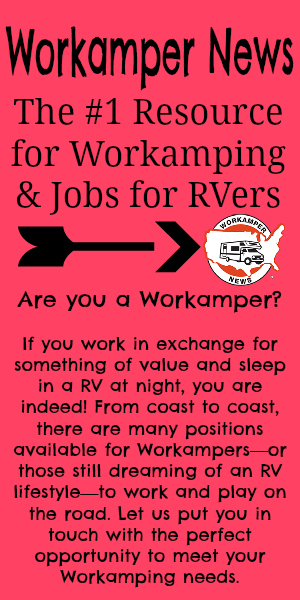 This is so cool, I would love to be able to do that, live in an RV full time, work at Walt Disney world. I grew up less than a mile from Disneyland in Anaheim and spent a lot of time there. Tried many times to get a job there over the years but just wasn’t in the right place at the right time, competition for the job openings was always pretty tough. I would be very interested in work camping at Disney World. How do you get connected to them?